You can whip up a batch of these gluten-free chocolate chip cookies in the time it takes for the oven to preheat. They’re that easy! What makes them so easy? Melted butter! You don’t need to cream the butter and sugar together for this recipe. To make these cookies, simply whisk together all the dry ingredients (there are only three) and combine with the butter-sugar-egg mixture. 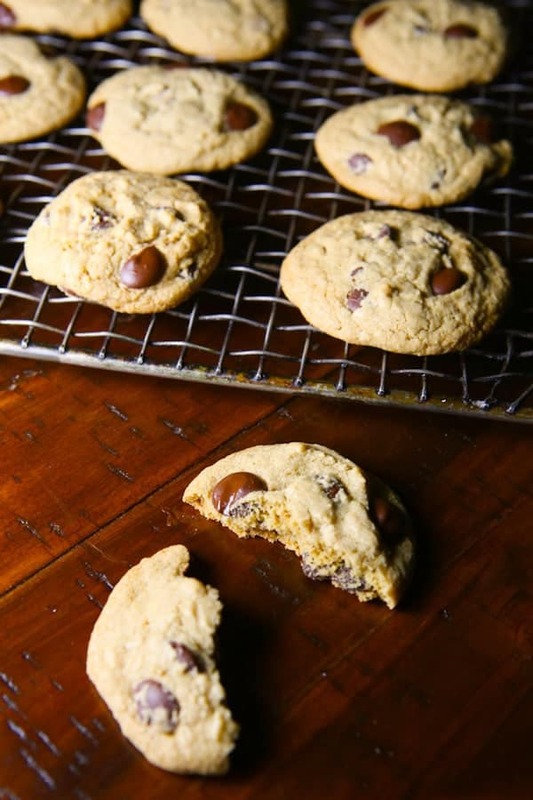 Of course, a generous amount of vanilla and chocolate chips are added to make these the perfect–and perfectly easy–gluten-free chocolate chip cookies! Ah, I love a simple recipe, don’t you? 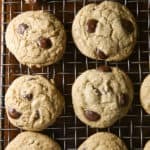 And I REALLY love chocolate chip cookies–I mean, I made a gluten-free chocolate chip cookie recipe for two for those times when I need cookies right.now. Then there were brown butter chocolate chip cookies. Oh, and we can’t forget gluten-free peanut butter chocolate chip cookie bars. 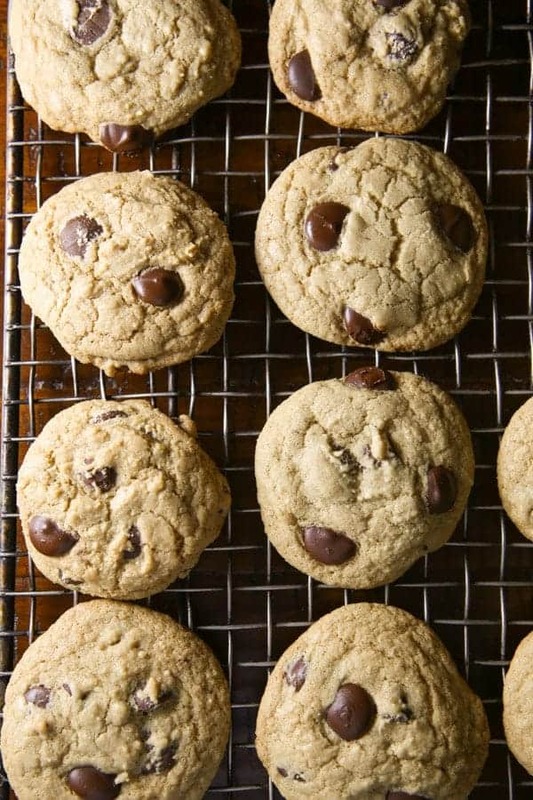 So I’m really saying something when I tell you that this simple recipe for chocolate chip cookies already climbed to the top of my favorites list. For this recipe, I used melted butter (yes, melted! ), the sugars, egg, and vanilla extract together in a large bowl. Mix this together until it’s thick. To me, the mixture kind of resembles a light caramel sauce. It’s so yummy looking! Then, add the dry ingredients, mix everything until a cookie dough forms, stir in the chocolate chips and you’re done. That’s it! If you want, you can even mix this recipe by hand. No handheld mixer needed! Not in this recipe! The melted butter gives the cookies a soft and tender texture. It does causes the cookies to spread a little but that’s not a bad thing! The flour blend, complete with xanthan gum, helps the cookies hold on to their shape for “just the right” thickness. 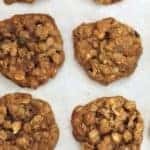 Not only do I LOVE, LOVE, LOVE the texture and flavor of these cookies, I love that I don’t have to worry about softening a stick of butter when I’m ready to bake. I don’t know about you, but whenever I’m in the mood for cookies, my butter is usually sitting in the fridge as a hard as a rock. For this recipe, I just microwave the butter until it melts. Done! Since this is a “mix and bake” cookie recipe, you don’t need to chill the dough before baking. WOOT! However, I must mention that you can chill this dough! In fact, if you age the dough for a few days, it takes on a lovely caramel-like flavor. When the dough is aged in the refrigerator for several days it won’t spread as much during baking. This is good to keep in mind because instead of pretty chocolate chip cookies, you get lovely little chocolate chip cookie blobs. But the blobs taste good! To age your cookie dough, mix the dough as directed and press a piece of plastic wrap directly onto the dough. This prevents the dough from drying out. Chill for up to one week. (Baker’s Tip: I usually transfer my dough from the mixing bowl into a smaller bowl to save space in the fridge.) 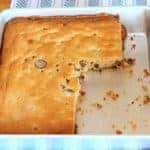 When you are ready to bake, allow it to sit on the counter for about ten minutes before scooping or it will be too firm to scoop. Bake as directed. Whether you age the dough or not, you need to shape it before you bake it. 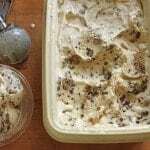 For this task, I suggest using a cookie scoop. This ensures that all of your cookies are the exact same size. When cookies are the same size, they take the same amount of time to bake. Scoop the dough from the bowl onto a parchment-lined cookie sheet. You don’t need to form the dough into a ball, the scoop will do that for you. 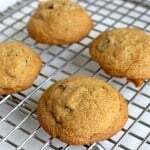 If you don’t own a cookie scoop, measure out about two tablespoons of dough and roll the dough into a ball before placing on the cookie sheet. If you don’t roll the dough into a ball, you’ll get weird ameba-shaped chocolate chip cookies. Since these cookies spread, don’t crowd them onto the pan or you’ll end up with one giant cookie. (Actually, that doesn’t sound too bad! In another post, we’ll have to make giant chocolate chip cookies.) Space the cookies about two inches apart on your baking sheet–I do three rows of three. Bake the cookies until the edges are just golden brown. In my oven, this takes about ten minutes. When they are done, allow them to cool on the pan for about five minutes and then transfer the cookies to a wire rack to cool completely. Store the cookies at room temperature for up to four days (good luck making them last that long!) or freeze for up to three months. Use 1/3 cup each dark chocolate chips, milk chocolate chips, and white chocolate chips. Recipe Note: For best results, use Bob's Red Mill 1-to-1 Gluten-Free Baking Flour. Adjust oven rack to 350 degrees F. Line two baking sheets with parchment paper. Whisk together the flour, baking soda, and salt together in a medium bowl. In a large bowl, combine the melted butter, dark brown sugar, granulated sugar, and vanilla extract. Mix until smooth. Add the eggs, one at a time, and mix until combined. The mixture should look like thick caramel sauce. Stop the mixer and add the flour. Mix on medium speed until a thick dough forms. Add the chocolate chips and stir until incorporated. Drop dough, about two tablespoons each, onto prepared cookie sheet. (A cookie scoop makes this easy.) Space cookies about 2 inches apart--you don't want more than 9 cookies on the sheet. Bake until golden brown, about 10 minutes. Rotate the baking sheets halfway through baking. Allow the cookies to cool for five minutes and then transfer to a wire rack to cool. Repeat with remaining dough, allowing cookie sheet to cool between each batch. We tend to have more cookies than cake since it’s just the two of us now. We can freeze cookie dough and thaw it out easily to have a quick batch, whereas cakes seem to go to waste. Thank you so much for the tip on Bob’s Red Mill 1 to 1 Gluten Free Flour! I made banana bread with it this weekend to use up a glut of over ripe bananas and it works like a charm! Can’t wait to try it with these chocolate chip cookies! This is one of the greatest chocolate chip cookies i’ve ever had! Very caky and you cannot tell they are gluten free. I highly recommend this recipe!